Andreas Seidel was born in Bad Saarow, Germany and lives in Berlin. After his studies he worked as freelance graphic designer and illustrator. 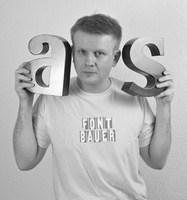 Since 2002 he runs his own type design studio called astype. Within the last years he has released several fonts and type series like Astype Ornaments, Secca, Secca Soft and Vtg Stencil. In recent years he worked intensive on vintage wood and stencil types like Wood Bonnet Antique or Vtg Stencil Germany No.1.